No huge surprises last week from the Fed until early this week, when the Fed's Lockhart said that the economy is "close" to being ready for a rate hike, and turned MBS lower. Lockhart said that he feels that the economy would have to perform significantly worse than expected to prevent the Fed from raising the federal funds rate in September. Investors moved up their expectations for a September rate hike after the comments. Last week the only real reaction was to the Employment Cost Index, which was the lowest ever recorded since it was started in 1982. Despite some weak news from private sector jobs, it seems that the ISM Services data that came in at a 10-year high continued to push MBS lower, as we have seen a pretty big drop in the past couple days. 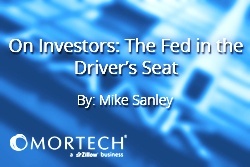 The true driver is going to be the Fed and how serious they get with their tone of a September rate hike. If the tone continues from other Fed officials that a September hike is reasonable, we may start to see a significant decrease in MBS over the next month. SunWest Mortgage Company has updated their underwriting guidelines for conventional loans. Caliber Home Loans has updated the ranges for their Foreign National loan products. Chase has updated their Agency High Balance adjusters. They have also revised their LTV and FICOs for Non-Agency LLPAs and added an adjustment for NOO transactions. Redwood Trust has updated their FHLMC Conforming Program Eligibility Guide v3.4. Freedom Mortgage has changed several base LLPA’s on their SPG rate sheet. They have also dropped their LLPA on conventional loans with amounts under $150,000. Finance of America now only allows credit scores down to 580 on VA loans, not FHA. Franklin American Wholesale has updated their guides to align with Fannie Mae. AFR Mortgage has updated their FHLMC LLPAs. GMFS has updated their Seller Guides for Brokers and Correspondents. They are also updating their LLPAs effective August 11, 2015. PMAC Correspondent is now Finance of America Mortgage. CMG Financial has updated their rates sheets for their wholesale channel. They have also updated credit policy for government and conventional loans in the correspondent channel. Parkside Lending has updated their requirements for limited/streamlined review of established condos. SunTrust Mortgage has made minor corrections to their rate adjustment pages. Farmington Bank has updated their rate sheet to include subordinate financing LLPAs. First Community Mortgage has updated their Seller Guide and Product Guides as well as changes to VA and FHA. BB&T Mortgage is now requiring that all jumbo loans be underwritten by BB&T prior to closing. Florida Capital Bank Mortgage has updated their product guides. The Money Source has updated their Correspondent Seller’s Manual. They have also added a pricing improvement for loans amounts $250-350K. PRMG has updated all their product profiles. US Bank has updated their price adjustments on Jumbo Fixed and ARM products. NYCB is offering a pricing improvement on Conforming Fixed High Balance. They have also announced new price adjustments for Core Portfolio programs. M&T Bank has updated their Agency underwriting eligibility standards. PHH Mortgage has released a product announcement on USDA loans and an underwriting announcement.